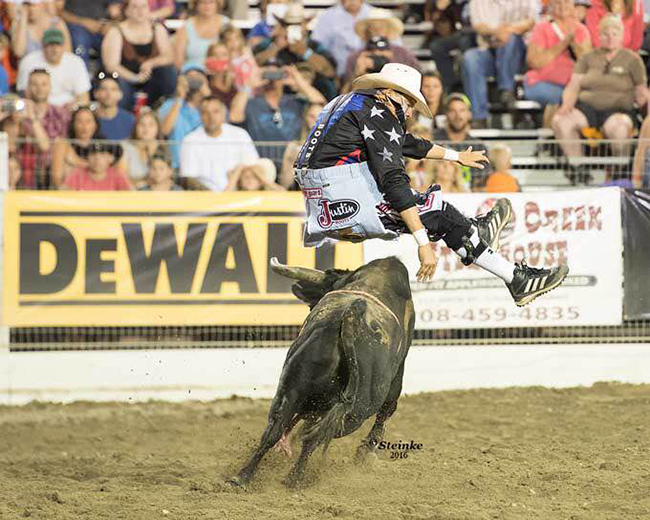 CALDWELL, Idaho – Having served as a protection bullfighter for a few years, Cody Webster knows all about the raucous crowd at the Caldwell Night Rodeo. On Tuesday during the opening night of the five-night rodeo, Webster showed that crowd his tremendous athleticism during the Bullfighters Only tour competition that concluded the performance. He posted an 89.5-point fight on 12X Fighting Bulls’ Little Foot to claim the title. “It was awesome, and it was in front of a sold-out crowd,” said Webster of Wayne, Okla. “Caldwell, Idaho, is one of the premier rodeos in our sport. It was just a Tuesday night, and it was completely sold out. It was amazing. The four-man bullfight was just what the crowd needed. In addition to four of the top men in the world, it also featured the fighting bulls from former bullfighter Darrell Diefenbach. From the opening moment, the stage was set. Allard, of Vinita, Okla., wasn’t the only one who struggled a little with his aggressive bull. Nathan Harp of Tuttle, Okla., also got knocked down a bit. Allard finished with 73 points, and Harp was 81. Dusty Tuckness of Meeteetse, Wyo., wrapped up a solid fight with an 86-point score. But the night belonged to Webster. “One of my good buddies, Nate Jestes, who leads our standings, had that little black bull at Reno, and I think he ended up winning the night,” Webster said. “He’s just a really good fighting bull. He runs the whole time and doesn’t really get away from you. It’s vital to have strong bulls in a fight. The better the bull, the better the score can be. But that also opens the door for potential danger. Both Allard and Harp went down, and their scores reflected that. “Nathan had kind of a bad go,” Webster said. “The bull got him caught and knocked down. When you get knocked down and take a shot, it usually takes a little out of you. He pocketed $1,500 for winning Caldwell and kept himself in contention for Bullfighters Only’s inaugural world championship.